It’s not every day you leave your comfortable life (i.e. home, work, stuff, first world conveniences, friends and family) to embark upon a personal journey of travel, volunteer and work exchange opportunities, and the unknown. This is something that you don’t just do overnight, but that you think about for a long period of time, at some point decide to actively pursue, and slowly plan and prepare for your exit. 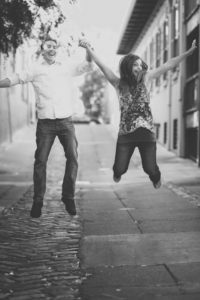 We’ve had a couple of friends embark upon long-term travel within the past several years (other couples) whom we’ve talked to extensively about their experiences. We’ve also had individual friends pursue long-term, solo travel in their lifetimes. Apparently, Aaron, my husband, always knew he wanted to do something like this, but for me, it was something that gradually developed. For as long as I can remember, I’ve acknowledged to myself that I haven’t traveled much and would like to more, and the desire grew from there. I also felt like I was missing out. Hearing about other friends’ experiences was so interesting; where they went, how they did it financially, what it was like to quit their jobs and follow what most would consider an unconventional path. At some point it became something we started discussing as a possibility for ourselves: Before buying a house and starting a family, taking a period of time to travel longer than the standard 1-3 weeks of vacation that employers typically approve that is socially acceptable in the U.S.; for me, it has been a priority to accrue and accumulate this time, thus foregoing the ability to take shorter time off here and there throughout the year, going longer streaks of time working without much of a break (lucky for Aaron, he accrues more time off than me and has actually had a couple of 1-month periods of time off approved by his employer in the past). My trips with Aaron to Greece, Croatia, Slovenia, Bosnia-Herzogovina, and Italy made me realize how much I enjoy traveling abroad and want to do more of it, and for a longer period of time. Traveling long-term would eliminate the inevitable mental countdown of how many days I have left on vacation (although I would like to point out that what we’re about to do is more often living day-to-day in various places within a budget rather than the traditional sense of “vacation”), no matter at what point on it, before having to make the long journey home and go back to work with the downer, vacation-is-over-and-back-to-the-grind blues (regardless of where I worked at the time and my satisfaction-level with work). Particularly, I’ve noticed our travel style is often seeking out non-touristy areas and going off the beaten path a bit, which I initially gained confidence with in Greece since I knew enough of the language to communicate in areas where seldom to no one else spoke English (I realize it won’t be like this everywhere we visit). Also, it feels a bit constricting and rushed to cram visiting whole countries and their regions into a confined period of time, but it’s what I had and I was grateful for that (and realize that many people don’t even have that opportunity). Finally, I generally (and historically) have an inclination and tendency to follow the rules and expectations that society, and others in my life, have of me. I went straight from high school to college and graduated in 4 years. I was fortunate to secure a regular, full-time job within a couple of weeks out of school. I’ve consistently worked regular, full-time jobs back-to-back (with at most, a week or so in-between to transition) ever since, bringing me to now, where I’m 30 and am seeking some adventure through doing something different! I’m also embracing the fact that I’m doing something I want to do for myself that is not what I, nor others, expect from me, and letting go of worrying what others think of my choice (well, except if it’s supportive of course)! We started talking about taking a 1-3 month “sabbatical” from work over a year ago, should they grant us that period of time off. But once we started listing out where we wanted to go and what we wanted to do, we realized the time it would take to do it far exceeded the 1-3 month time period, and we’d decided it would be highly unlikely for either of our employers to hold our jobs for 6 months to 1 year, or an otherwise indefinite period of time. I felt foolish even thinking about what it would be like to ask for something like that, in an environment where seemingly the only acceptable excuse for missing work for longer than 1-2 weeks at a time (3+ weeks is a BIG ask, and a stretch) for vacation would be job-protected leave due to injury or illness, or having a baby/adoption. I’ve also had a personal, deep desire to make a change in my career focus over the past several years, feeling an internal pull to pursue my passion for my health and fitness endeavors primarily rather than as something I do on the side of my full-time employment in human resources/recruiting, which I’ve pretty much juggled to make both work since late 2009 (and it’s exhausting — I’ve far exceeded the point where it makes for an sustainable work/life balance and I feel the need to choose in order to live a more healthy lifestyle personally, something I encourage others to do and want to be a positive example of). I almost took that leap before accepting an offer for my current job over 2 years ago, but decided the opportunity was too good financially and in essence of what I’d be doing (focusing on recruiting, my favorite HR function) to pass up; so I tabled my dream for a little longer, acknowledging that the right time to make the move would come. I came to realize that transitioning my career focus after returning from long-term travel felt like the perfect time, which made the decision to leave my HR job much clearer. However, I fully acknowledge that it’s the best work environment I’ve had the opportunity to work in [e.g. I have my own office, laptop/cell phone, a kind HR team — my boss and 2 coworkers — where all of us genuinely like one another personally and overall work well together professionally, I’m compensated very well (significantly more than in my past positions at other companies), I’ve always felt openly appreciated and acknowledged for my contributions, and being a company’s employment Recruiter in this role, for this company, has really played to my strengths and prior experiences; it’s also provided for a very comfortable lifestyle that’s contributed to us being able to live below our means and save for our future, including this long-term travel experience]. All this being said, I think my decision to leave speaks to how much I value the chance to have the opportunity I’m about to embark upon; that at the end of the day, I’m willing to give it all up for what I am banking on will be a very uniquely rewarding experience (i.e. long-term travel that includes volunteer and work exchange opportunities) and for a career focus change where if I don’t just do it, I’ll always wonder what could have been, and if it could have worked out for me to pursue my calling. How do I feel and what am I thinking? Excited. Nervous. Scared. I am generally a risk-averse person who sticks with my regular routines, so taking a leap of faith to leave steady employment, my home, and my comfortable lifestyle to travel long-term, live out of a backpack, and change my career focus is HUGE for me! These decisions are certainly out of character for me, leaving the certain and predictable for the uncertain and unpredictable, the stability for the instability, the tame for the adventurous, you get the picture. I also feel like these decisions have been thoroughly thought out and discussed over a long period of time, so the buildup and preparation actually has been in character for me after all; these are not rash, impulsive choices, but ones that have actually been in the making for awhile and feel like a long time coming! Without a doubt, I will be voluntarily putting myself in some innately uncomfortable situations, such as going places where I don’t speak the local languages fluently, if at all, and navigating those places without any familiarity of them. I’ll be living out of a 40L backpack (yes, I’ve challenged myself to pack light, in a carry-on-sized bag, for the feeling of carrying light weight in a less bulky pack, and living simply, although part of me is tempted to take my 75L pack I’ve taken abroad for 2-3 weeks at a time previously for the comfort in knowing I can take more and will have extra space). I’ll have a very limited wardrobe and footwear to choose from for this period of time, many items having multiple purposes (e.g. pants that convert into shorts; shoes that can be used for hiking, walking, or other fitness-related activities; a garment I can wear as a dress, skirt, shirt, scarf, etc). I won’t have the ability to “do” my hair every day or wear much makeup (not that I do often anyway, but it’s a comfort knowing I always have the option in my normal, daily life). I’ll be washing my clothing in the sink primarily, not the start-the-washer/dryer-and-walk-away setup I’m accustomed to (although I do regularly hang-dry most of my clothing). There will be places without air conditioning or warm water, and days where we encounter issues getting from one place to another, resulting in long, uncomfortable, exhausting travel days. There will be accommodations we’ll stay in that are less cleanly than I’d prefer. I’ll encounter food I’m unfamiliar with, which may take time for my body to acclimate to digesting, being introduced to new bacteria, and I may become ill with traveler’s diarrhea or other discomforts and inconveniences. And I’m sure I’ll get homesick, missing my family, friends, fitness peeps, and comforts of my home and life in Sacramento. BUT, there are many positive trade-offs (and most of the things I’ve just described, at-length, are “first world problems”; I feel partially bad just sharing them publicly, knowing these worries are unique to the developed world, but in my openness of sharing my feelings, I’m just being honest about what comes to mind for me). So, how did we tell our landlord and break the news to our employers, family, and friends? How does one even know where to start planning, preparing, and making arrangements for something like this? Stay tuned for more! In the meantime, here’s to taking a BIG LEAP of faith! 4 Responses to "The Cat’s Out of the Bag!" Very nice post, I can’t wait to embark on this journey with you! <3 Thanks, babe! Me too! This is so exciting! I know that your descriptions will help us feel like we’re right there with you. Maybe, just maybe you’ll help others see how they could achieve such a brave and remarkable feat! Be safe and enjoy the world🌎. Thank you for your lovely, encouraging words! I would love if our decisions and experiences inspire others to embark upon something similar, or even just spark the thoughts to self-assess what they’d like to pursue in life and how to go about doing it/making it happen!